To send dynamic data via the RDS it's very useful to link the RDS encoder with your broadcast automation system. This usually results in a possibility of sending commercials, actual song information, program announcements and more. Almost any broadcast automation system can be linked with our RDS encoders. The link may be either indirect or direct. 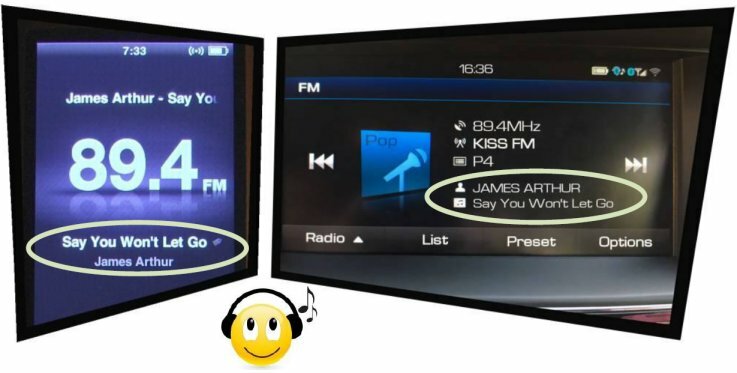 The RT+ feature (also called "tagging") is designed to let the listener take additional benefit from the Radiotext service by enabling receivers to offer direct access to specific elements of Radiotext. Typically the RT+ feature supports song artist and song title elements. These elements anyway carried in the Radiotext, are identified by their class type, length and location within the Radiotext. Our RDS encoders include full support for the RT+ and its handling is highly automated. For direct use your broadcast automation system must support X-Command or the RT+ function either by means of user defined groups or by the command RTP=. In other cases the Windows control software used in the indirect link configuration can provide the RT+ functionality. In the indirect link configuration, the broadcast automation system provides text information usually as a text file. That file is periodically checked by the RDS encoder's control software and it is sent to the RDS encoder upon detection of a new text - for example when a new song starts playing. Default Windows RDS software for our RDS encoders is the Magic RDS 3. This application, including documentation and examples of use, can be downloaded in section Software. We made a pile of work for the linking feature to work with almost any application playing sound files and providing some relevant text output. Nevertheless broadcast automation systems with RDS functionality support our RDS encoders directly. The indirect link configuration may be more difficult to set-up due to absence of standardized text output across all broadcast automation systems. On the other hand, this method allows better customization of the final text and mixing various text sources. Consider the best text output your broadcast automation system can provide for this purpose. This may be a music log file, now-playing file, HTTP web file etc. Open that file using Windows Notepad to analyze its structure - how the text desired is saved inside the file. In the Magic RDS, enable appropriate text service (usually Radiotext 1), proceed the Text setup and open the External text tool. Enable and configure the Text source in the External text dialogue box. As mentioned earlier, the external text source configuration is different for each broadcast automation system. Since probably hundreds of automation systems are used around the world and new versions are released often, information in this document cannot be full-scale. For more information about how to configure the broadcast automation system text output, please read its documentation or contact their support. The Magic RDS configuration examples can be found in this guide and in our Technical forum. In the direct link configuration, the broadcast automation system communicates to the RDS encoder without any intermediator. For the present turn off the RDS encoder support in the broadcast automation system. Connect the RDS encoder and configure all basic parameters like PI, default PS, text setup, enable appropriate text service (usually Radiotext 1). Use the Windows control software or a terminal application. Store all setting into EEPROM. Exit the Windows control software or the terminal. Find out the baudrate (speed) or network protocol that is used by the broadcast automation system for communicating with the RDS encoder. Configure the connection parameters, using Device setup dialogue box or a terminal. Turn on the RDS encoder support in the broadcast automation system. For more information about how to control the RDS encoder contact the broadcast automation system vendor or follow our Technical forum. RDS encoders from the P132 family support all relevant data formats (protocols) on all communication ports. Thus they are compatible with all broadcast automation software which allows direct RDS encoder control. This applies to TCP/UDP communication as well as to connection via serial port or USB. Terminating character: <CR> (Carriage return). <CR><LF> accepted as well. See the Technical manual for complete list of all ASCII commands. The X-Command is the newest and preferred method how to forward text information (incl. tagging) from the broadcast automation system to the RDS encoder. It is based on a simplified markup language. The X-Command is fully supported by the P132 RDS encoders family and it's supported by all broadcast automation systems which allow the user to define output data template. For more details follow the information in the document X-Command for RDS Encoders.